Is there sand in Antarctica? There's a song "Blizzard's Never Seen the Desert's Sand". Given Antarctica is a desert, someone questioned the title's validity. BUT is there sand in Antarctica? I'd imagine yes as it's a pretty basic soil and Antarctica is a big place, and I know there is land mass, not just ice, in Antarctica. I'm not sure though - any more info or evidence about the presence of sand? Yes. 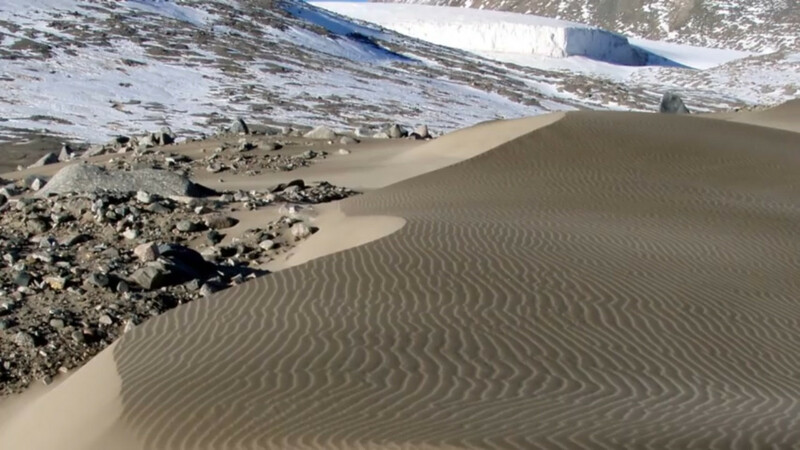 In fact, there are sand-dunes in Antarctica [1:15]. The scant areas that are free of snow and ice make up less than 0.4 percent of the continental land mass. In places there, the wind has built sand dunes. This article by Burton-Johnson et al., 2016 on automated satellite analysis methods, summarized in this DailyMail article, indicates refined estimates nearer 0.18% of the continent is not covered by ice/snow. Based upon the area of Antarctica from Wikipedia (you might be surprised how big Antarctica is! ), that would equate to around 10,000 mi$^2$ of uncovered land (see comments for comparison). Of course it may well be that not even all of that area is sand. It looks from the articles like the largest place to find these sands are the McMurdo Dry Valleys, such as Victoria Valley, which are on the Eastern Antarctica sublandmass [see the sentences directly above the image entitled Deglaciated Antarctic Toporgraph, plus that image itself]. So it sounds like they really do exist, but are relatively rare expanses! Not the answer you're looking for? Browse other questions tagged geology sedimentology soil geomorphology antarctic or ask your own question. How do glaciers move? Could Antarctica be separated? Are there areas of desert sands which experience blizzards? Is there any explanation for the large amount of sea ice around Antarctica in 2014? Is there conclusive evidence for the Antarctic Circumpolar Current developing after the glaciation of Antarctica? How could this “aztec temple” mountain (or volcano) have been formed on Antarctica? How are sand blocks formed?